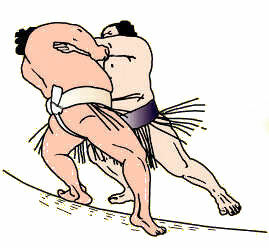 Tochinoshin (à gauche) dépose le yokozuna Kakuryu en dehors du dohyo. Cette onzième journée fut bien difficile pour la majorité des lutteurs de haut rang, à quelques exceptions près. Le grand champion mongol Kakuryu a subi sa première défaite mercredi, alors que le yokozuna Hakuho est devenu le leader avec un score parfait de 11-0. Le yokozuna Kisenosato (8-3), qui a obtenu son premier record de victoires hier, a également souffert du sekiwake Ichinojo lors de l’avant-dernier combat de la journée. Ichinojo (4-7), qui pèse 227 kilos, a commencé par frapper Kisenosato puis a clos le combat d’une dernière poussée alors que le yokozuna tentait de résister à ses gifles. Kakuryu, qui a remporté deux championnats consécutifs plus tôt cette année, a été battu par Tochinoshin (7-4). L’ozeki géorgien a saisi la ceinture de Kakuryu des deux mains et l’a soulevé jusqu’au-delà des ballots de paille, tout en force. Tochinoshin, le vainqueur de la compétition de janvier, est en situation de « kadoban« , menacé de rétrogradation et a besoin d’une victoire de plus pour conserver son statut lors du prochain grand tournoi. Lors du dernier combat de la journée, Hakuho a facilement battu l’ozeki Takayasu (9-2). 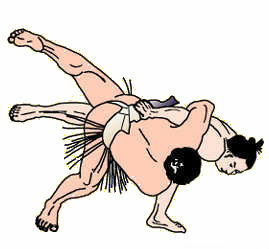 Après trois faux départs, Hakuho frappa Takayasu de sa main droite et le chargea afin de le renverser par-dessus bord. Hakuho s’est rapproché de sa première victoire en championnat cette année et d’un 41e titre de champion dans la division d’élite makuuchi. 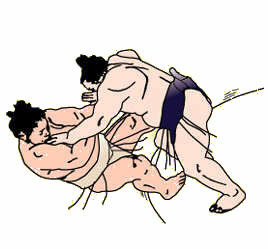 Takayasu est le seul lutteur au deuxième rang du sumo à n’avoir pas encore remporté de championnat de cette division. Le sekiwake Mitakeumi (6-5), qui a remporté le championnat précédent en juillet, a subi sa quatrième défaite consécutive, en perdant son combat contre le maegashira Kaisei (5-6). 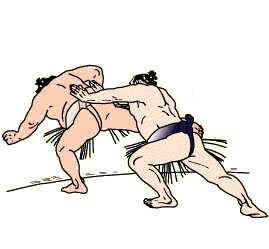 Le maegashira brésilien Kaisei a littéralement enveloppé de ses bras le sekiwake et l’a fait tomber du dohyo avec lui. Le meilleur combat de Kaisei depuis le début du tournoi. 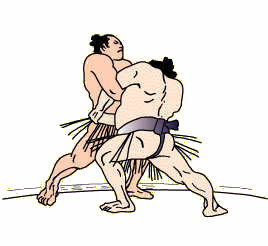 L’ozeki Goeido a décroché une victoire facile face au numéro 3 Shodai (5-6) pour rester deux victoires derrière Hakuho. Goeido est à égalité avec le maegashira n° 13 Takanoiwa et Takayasu à 9-2. Takanoiwa à démontré sa détermination en battant Kotoshogiku (6-5). 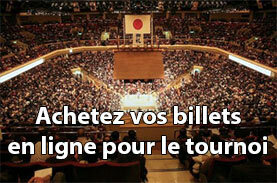 Demain, 3 matchs de choc avec Tochinoshin vs Hakuho, Kakuryu vs Takayasu et Kisenosato vs Mitakeumi ! 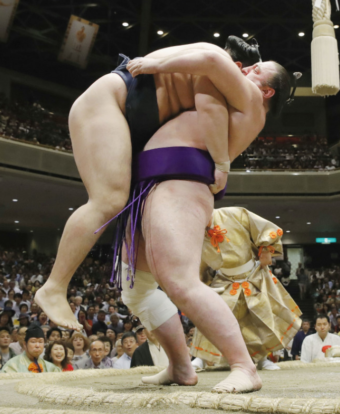 TOKYO (Kyodo) — Mongolian grand champion Kakuryu suffered his first loss on Wednesday, as yokozuna Hakuho emerged as the sole leader with a perfect 11-0 record at the Autumn Grand Sumo Tournament. 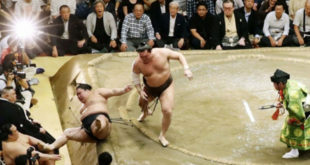 Yokozuna Kisenosato (8-3), who secured his first winning record in nine meets on Tuesday, also suffered an upset at the hands of sekiwake Ichinojo in the penultimate bout at Ryogoku Kokugikan. 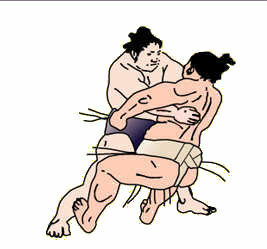 The 227-kilogram Ichinojo (4-7) started out by slapping Kisenosato’s face, and gave him a final shove as the yokozuna tried to resist the slaps with his hand to no avail. 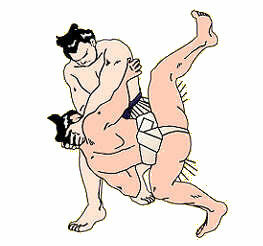 Kakuryu, who won back-to-back championships earlier this year, was defeated by Tochinoshin (7-4). 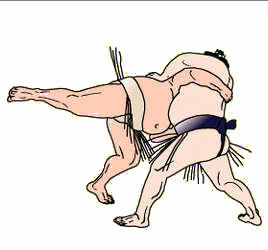 The Georgian ozeki grabbed Kakuryu’s belt with both hands, and lifted him over the straw bales in a frontal force out. Tochinoshin, the winner of the January meet, is competing as a demotion-threatened « kadoban » ozeki and needs one more win to maintain his No. 2 status at the next grand sumo tournament. In the day’s final bout, Hakuho posted an easy victory over ozeki Takayasu (9-2) after psyching out his opponent with three match delays. 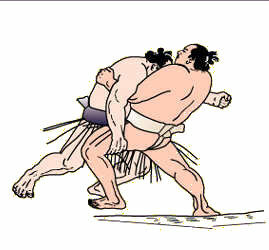 Hakuho slapped Takayasu with his right hand, and charged into him before upending him over the edge. 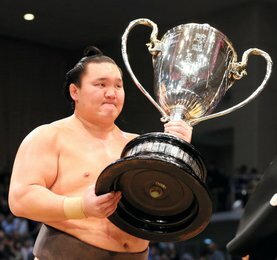 Hakuho has moved closer to winning his first championship this year, and a record-extending 41st career title in the elite makuuchi division. 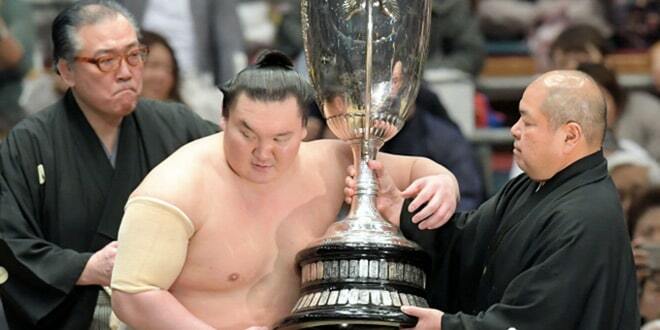 Takayasu is the only wrestler in sumo’s second-highest rank who has yet to win a top-division championship. Sekiwake Mitakeumi (6-5), who won the previous championship in July, suffered his fourth straight defeat here, losing his bout to top-ranked maegashira Kaisei (5-6). Brazilian maegashira Kaisei put his arms around the fan-favorite sekiwake, and sent him flying headfirst off the raised ring. 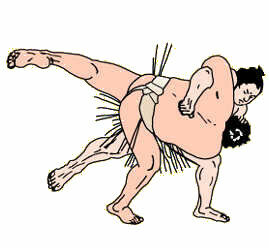 Ozeki Goeido posted an easy win over No. 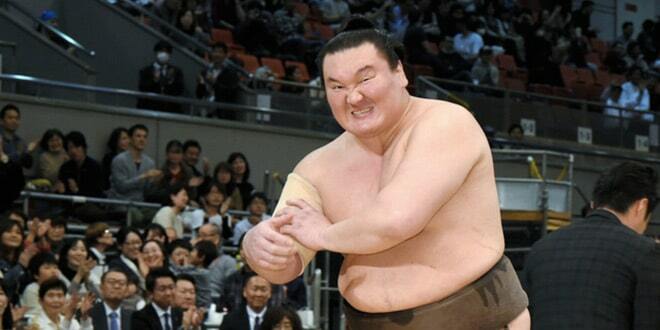 3 Shodai (5-6) to stay two wins behind Hakuho. Goeido is tied with No. 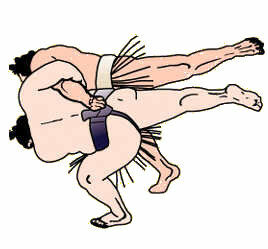 13 maegashira Takanoiwa and Takayasu at 9-2. Takanoiwa beat No. 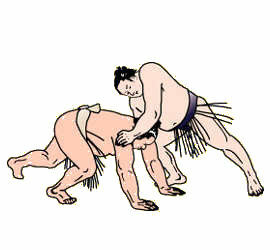 8 Kotoshogiku (6-5). 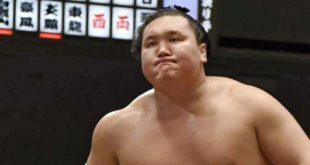 Takanoiwa, who suffered a concussion in an after-hours assault by fellow Mongolian Harumafuji last October, prompting the yokozuna’s retirement, returned to the top division after winning his second juryo division championship in a playoff at the July meet in Nagoya.